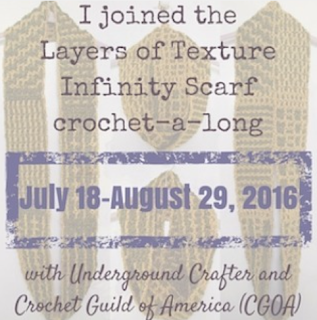 This month I've been taking part in a fun Crochet-a-long (CAL): the Crochet Guild of America CGOA Layers of Texture Infinity Scarf by the wonderful Marie Segares. And I thought I'd tell you the reasons why I really love being part of a CAL group. CAL: As the name suggests, this is a project in which a number of people each crochet the same pattern at the same time, often from different locations. 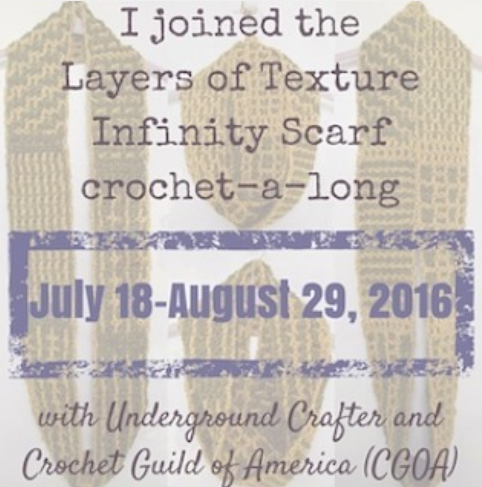 It’s a great way to gain a sense of community while crocheting and to create some deadlines for yourself. In a CAL you have an opportunity to ask questions. My current CAL has a Facebook Group and a Ravelry thread for this. If you're too shy to ask questions, you are quite likely to find your answer looking at the issues that other people had and the solutions they found. It's also a valuable experience for me as a crochet teacher to see what difficulties people have and how they overcome them. It helps me support my students better when they get stuck. Another reason to join a CAL is that you are more likely to actually finish your project. Seeing other people post their progress photos is wonderfully motivating! I was having such a hard time finishing a sock (I kept starting new ones) but last month's sock CAL did the trick. The CAL has a deadline that everyone works to. 4. Being part of a group is fun! 5. And there are prizes too! Here's a super article on how to find and join your first or next crochet-a-long by Marie Segares on her Underground Crafter blog. Why not give it a whirl? That book is on my list too! I'm glad you ate having fun with the CAL and you have given me a new stitch to look up - ladder stitch. Have fun with ladder stitch Jodie. Believe it or not I actually won that book as a prize in the CGOA cal. What a coincidence! I can't wait for it to arrive. Stitch eye candy! My podcast debut - woohoo!